Oracle has introduced Extended Data Types in 12c. If you still don’t know what they are and how enable them, refer to the awesome oracle-base blog or the official documentation. Here, I’ll show where they are stored, and when. If the table is created with a varchar2 length above 4000, a LOBSEGMENT and a LOBINDEX segments are also created automatically. But actually, the rows inserted may be short enough to be stored inline. A-ah! The row size is increasing but the blocks are actually allocated in the table segment, this prove that the rows are stored inline! Where’s the break point? When the rows will be migrated to the out-of-line storage? SYS_LOB0000096549C00002$$ LOBSEGMENT 10682368 1304 <<<<<<<<< HERE! Actually, it’s somewhere between 3960 and 3970 bytes, but it may depend on other factors (I havn’t tested it deeply). Lesson learned: when you design your table with extended types, you should plan how many rows you expect with a size below 4000, because they can make your row access slower and chained rows higher than expected. Let’s try almost the same excercise, but this time starting with a table created with a small length (lower than 4000) and altered afterward to make use of the extended size. The blocks have grown in the table segment, the rows are still inline!! This lead to a huge amount of chained rows!! In this example, 2 blocks per row, but it can be as high as 5 blocks for a single column varchar2(32767) with db_block_size=8192. So we need to rebuild the table, right? WRONG! Even after a rebuild the extended varchars are stored INLINE if they have been created as standard varchars. Actually you need to recreate the table and migrate with dbms_redefinition. Migrating to extended datatypes instead of converting your application to use secure files can be a disaster for the physical layout of your tables, thus for the performance of your application. Be careful! Please see the disclaimer at the end of the post. Oracle has announced the new Oracle Database Backup Logging Recovery Appliance at the last Open World 2013, but since then it has not been released to the market yet, and very few information is available on the Oracle website. During the last IOUG Collaborate 14, Oracle master product manager of Data Guard and MAA, Larry Carpenter, has unveiled something more about the DBRLA (call it “Debra” to simplify your life 🙂 ) , and I’ve had the chance to discuss about it directly with Larry. At Trivadis we think that this appliance will be a game changer in the world of backup management. That’s not all. As of now, your best recovery point in case of restore is directly related to your backup archive frequency. Oh yes, you have to low down your archive_lag_target parameter, increase your log switch frequency (and thus, the I/O) and still have… 10, 15, 30 minutes of possible data loss? Unless you protect your transactions with a Data Guard. But this will cost you money. For the additional server and storage. For the licenses. And for the effort required to put in place a Data Guard instance for every database that you want to protect. You want to protect your transactions from a storage failure and there’s a price to pay. The Database Backup Logging Recovery Appliance (wow, I need to copy and paste the name to save time! :-)) overcomes these problems with a simple but brilliant idea: leveraging the existing redo log transport processes and ship the redo stream directly to the backup appliance (the DBLRA, off course) or to its Cloud alter ego, hosted by Oracle. As you can infer from the picture, 12c databases will work natively with the appliance, while previous releases will have a plugin that will enable all the capabilities. 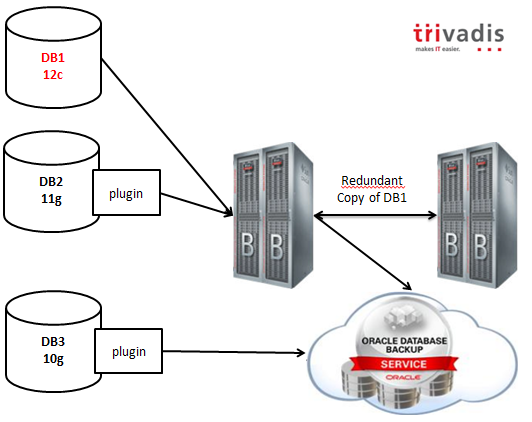 Backups can be mirrored selectively to another DBLRA, or copied to the cloud or to a 3rd party (Virtual) Tape Library. The backup retention is enforced by the appliance and the expiration and deletion is done automatically using the embedded RMAN catalog. Lightning fast backups and restores are guaranteed by the hardware: DBLRA is based on the same hardware used by Exadata, with High Capacity disks. Optional storage extensions can be added to increase the capacity, but all the data, as I’ve said, can be offloaded to VTLs in order to use a cheaper storage for older backups. Looking forward to see it in action! By the way, I expect that the competitors (IBM, Microsoft?) will try to develop a solution with the same characteristics in terms of reliability, or they will lose terrain. Disclaimer: This post is intended to outline Oracle’s general product direction based on the information gathered through public conferences. It is intended for informational purposes only. The development and release of these functionalities and features including the release dates remain at the sole discretion of Oracle and no documentation is available at this time. The features and commands shown may or may not be accurate when the final product release goes GA (General Availability). Please refer Oracle documentation when it becomes available.